Building and shaping the culture of an organization begins with the behavior of the leaders. 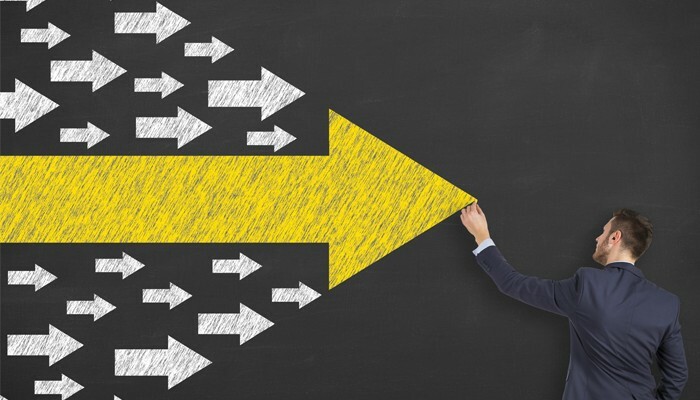 When leaders are behaviorally smart, and understand their leadership and communication style, they are more likely to set the kind of example they want everyone to follow. There is no one leadership style fits all. The key, through self-awareness, is to find the balance that works with the teams you lead. A leader who is fast paced, logical, challenging and tends to be critical may well deliver results, but can damage the talent they are responsible for leading. This style of leadership births a culture of stress, staff turnover and unwillingness to want to work under their leadership. The analytical, systematic, rigid, work by the rules, style of leadership may be a gatekeeper in terms of the processes of the organization, but can shut down innovation, spontaneity and the kind of creative approach to decision making required when things go wrong. This inflexible and rigid style of leadership does not inspire a culture of shared goals, thoughts and ideas. In today’s rapidly changing market, businesses need innovation to survive. A skeptical leader who is not open to ideas, continually questions, is guarded and fails to build trust with their teams, will not create the kind of innovative culture that breeds success. Finding a successful balance between trust and a healthy skepticism that protects the business is tough. Similarly, leaders whose focus is solely on results, who is very competitive and wants always to be the one who sets the agenda, can push teams too hard to achieve goals. If these leaders see targets slipping away they can become manipulative and assume a driven style of leading that causes teams to crash and burn. This approach leads to a toxic culture – very difficult to recover from. Leaders who are highly people focused and expressive, can inspire passion and purpose, but if this style of leadership is not based on a foundation of a clearly articulated vision and mission, the culture they create is one of chaos and confusion – but fun. Leaders such as this need strong boundaries and need to learn to focus on one goal at a time. Some leaders are comfortable with taking risks. They know their limitations and are comfortable with managing failure. However, when risk taking leads to over confidence, leaders will cut corners placing the business in jeopardy. Further, team members assume the culture of risk extends to them. This can lead to outlier behavior as they take inappropriate risk that undermines the organization. The highly creative leader embraces new ideas, can be quite abstract in their thinking and open to imaginative approaches to decision making. However, such creative ideas need to have value, they can’t be random as this leads to a culture of anything goes. Creativity in leadership works when it’s part of a culture that is sensitive to teams, colleagues and the overall needs of the business. Not many organizations survive on a cooperative style of decision making. When a leader is seen to be compliant others very quickly take advantage of them. They may well be able to communicate the vision and encourage input from teams, but without their own understanding of how to be behaviourally smart, this style of leaderships leads to the loudest voice getting their way. Further, it can lead to a culture of frustration as the leader seeks everyone’s opinion before making a call. Generally, the reserved, reflective leader tends to be a loner. They do not have an open-door policy and can be withdrawn. This style of leadership breeds a culture of suspicion and can lead to more outgoing team members driving the culture and making decisions that are inappropriate. However, when the leader understands the importance of building relationships, this style of leader is likely to be much more accurate in their instructions. They prefer to get things right first time and will reflect and focus on this. When a leader is overly understanding and tolerant there will always be others who will take advantage of this. A culture of leniency will prevail and mistakes will be repeated leading to frustration and discontent from team members. Generally, this leader tries to create a culture of stability, believing that everyone will function more effectively within the environment. This approach only works when everyone has knowledge of each other’s preferred environment for working, otherwise the culture will be too relaxed. Spontaneity challenges many people who prefer leadership to be structured and predictable. A spontaneous leader creates a culture of impulsiveness and lack of planning and forethought. Spontaneity panics some people and can lead to disruption and stress in the workplace. A good idea, a solid strategy, an understanding of clients genetic makeup could be a ticket to their success. But without this insight – failure is more likely both for you as an advisor and for the client who wants to be an entrepreneur. 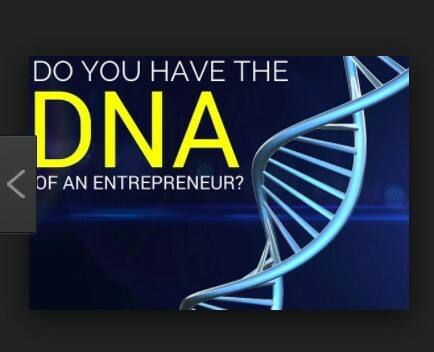 DNA Behavior International’s extensive research from recent academic research and studies supports the findings that a person is born with entrepreneurial genes. Providing advice to a client like this could be tricky. A key for financial advisors is to understand the genetic makeup of an entrepreneur. What makes them tick. All entrepreneurs have similar characteristics. Their minds are genetically wired in the same way. In other words, they tend to depart from established patterns of thinking. Their resilience and appetite for risk are inherent qualities. The more mindful financial advisors are in their understanding of the entrepreneurial mind, the greater the chances of success in delivering sound targeted advice. Resilience (Measured by the Fast-Paced trait) – they achieve results, manage setbacks and rationally take quick action. Risk Taker (Measured by the Risk trait) – confidently take risks and tolerant of losses. Creativity (Measured by the Creative trait) – innovative with ideas and seeks to differentiate. Work Ethic and Focus (Measured by the Pioneering trait) – pursues goals and is often ambitious and competitive. Charisma (Measured by the Outgoing trait) – outgoing, connects with a lot of people and influences people to follow them. Entrepreneurs are confident, passionate and determined to succeed. They are comfortable taking the risk and will invest heavily in their business venture, maybe to the detriment of other areas of their life. However, being genetically predisposed towards entrepreneurialism doesn’t guarantee that an individual will become an entrepreneur and then whether they will succeed. It is not just enough to be born with the entrepreneurial gene, people must do something with it. Financial advisors need to be able to dig below the surface to understand the dynamics of the entrepreneurial client and then can target advice. Comfortable being a user to test the financial validity of an opportunity. Confident enough to challenge ideas and ask questions. Trustworthy enough to encourage yet confront when the entrepreneur’s ideas are spinning out of control. When financial advisors understand that Entrepreneurs are driven by the need to succeed and control their own destiny, they are less likely to put them in a client box. They won’t deliver mundane advice but will recognize the importance of getting inside the mind and genetics of an entrepreneur. Entrepreneurs can’t do it alone. 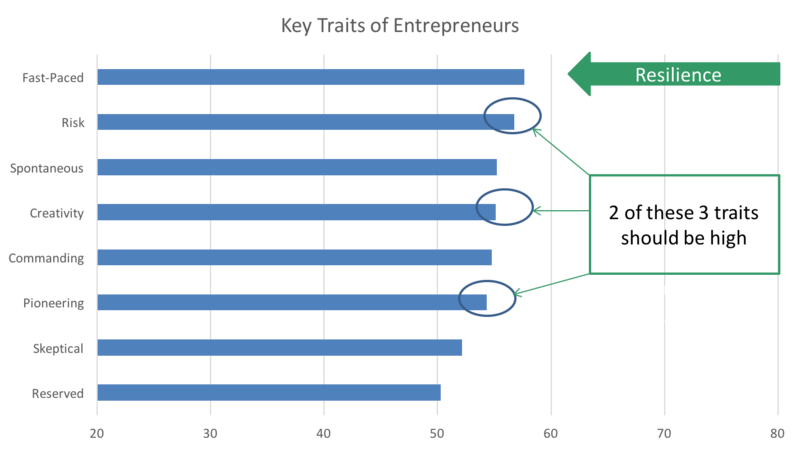 From start-up, the entrepreneur has many roles and will not have the skill set for all of them. Building the right team around them is critical to building a successful business. People tend to think of entrepreneurs as lone heroes, but this isn’t how it works in real life. Many live up to their reputation as risk-takers and some remain outsiders, but despite this outlier status, entrepreneurs need support to be successful. In fact, were a lot like Formula 1 race-car drivers: The person in the cockpit gets all the glory since fans tend to forget about the pit crew and the behind-the-scenes effort it takes to keep the driver on the track. 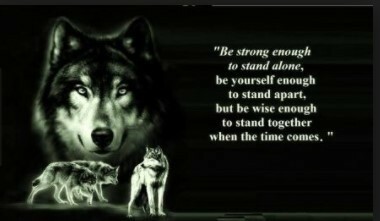 Business is no different; an entrepreneur does not succeed alone. Behaviorally smart entrepreneurs, who know their limitations, are more likely to have conversations about the skills they lack and reach out to others to fill the gaps. 1. Resilience (Measured by the Fast-Paced trait) – they achieve results, manage setbacks and rationally take quick action. 2. Risk Taker (Measured by the Risk trait) – confidently take risks and tolerant of losses. 3. Creativity (Measured by the Creative trait) – innovative with ideas and seeks to differentiate. 4. Work Ethic and Focus (Measured by the Pioneering trait) – pursues goals and is often ambitious and competitive. 5. Charisma (Measured by the Outgoing trait) – outgoing, connects with a lot of people and influences people to follow them. More importantly, they will have a deeper insight into their entrepreneurial genes and feel empowered, through this knowledge, to bring others on board to take up some of the heavy-lifting. As the business grows, entrepreneurs tend to feel besieged by the day to day workload. The appointment of someone, we will refer to as an Integrator, is a key first hire. Integrators should have the experience, skills, and temperament to manage the day to day business operations and understand how the entrepreneur ticks. This will ensure the business has a strong foundation. Further, it releases the entrepreneur to focus on building the business and using their entrepreneurial talents to do so. When the Entrepreneur and the Integrator have insight into their own and each other’s personalities, their communication style, and their decision-making approach, they understand where and when they need to modify their behavior to be a successful team. Understanding each other’s strengths and limitations ensures the gaps’ are filled, and the business can move forward. When an entrepreneur has no insight into their personality, hitting a no man’s land,’ such as dealing with day to day issues, managing 10-30 people and still trying to envision the business, they need to understand that failure is a very real possibility. It hasn’t got the innovation to keep growing. Once success is on the horizon, 30 employees can quickly become 50, 100, 500. This stage, moving into a sales organization, requiring sales systems and customer relationship management systems/processes, is where many entrepreneurs struggle. Such a level of hands-on day-to-day minutia (their interpretation) to grow can frustrate them. This is where an Integrator and Entrepreneur working well together can take a vision to market. Today I’m Going to be an Entrepreneur! Yes, there are times individuals wake up with an amazing idea and are convinced they are the next Sir Richard Branson, Bill Gates or Mark Zuckerberg. They persuade themselves that they are an entrepreneur. They may even attract investment for their idea. The market might be excited by this new offering BUT the truth is that most entrepreneurs fail to get their businesses off the ground. Even if they do, building and sustaining a successful business is rare. The 2015 US Census Bureau reports that 400,000 new businesses are started every year in the USA but that 470,000 are dying, a worrying statistic. John Chambers, Cisco’s CEO of 20 years, says this – More than one-third of businesses today will not survive the next 10 years. Shikhar Ghos, in his recent Harvard University study, claimed that three out of every four venture-backed firms fail. The strengths that make people entrepreneurs are counterbalanced by struggles that can get in the way of success. Without this self-understanding, decisions will be made that can cause the enterprises to fail. Much research exists now to confirm that entrepreneurs are born and not made. Having conducted extensive research to validate these findings, DNA Behavior International has identified the top five (5) genetic traits that are to be found in entrepreneurs. Having these genetic traits does not guarantee success for entrepreneurs. Learning to be behaviourally smart in using the powerful genetic ingredients they were born with is more likely to deliver success. 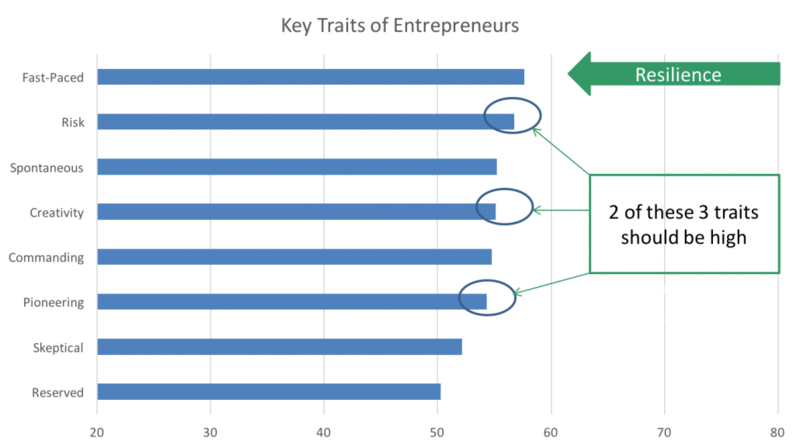 Of the 5 identified entrepreneurial traits listed above – resilience leads the pack. Building a business, handling the enormous pressure of setbacks, rejection of ideas, sustaining a business, managing staff, and dealing with market expectations, will never be plain sailing. If you are ever to see blue water, understanding the importance of resilience is a key factor. The resilience gene is measured by the fast-paced trait. When this trait measures more than 55 – results will be achieved, setbacks will be managed and the individual will be able to rationally take quick action in any given circumstance. Success in business is rarely about how many challenges you face so much as it is a matter of how you respond to the challenges. Entrepreneurs who are behaviorally smart, and understand their personality and genetic makeup, will have a level of resilience which allows them to face an almost constant barrage of challenges without ever weakening their resolve or losing their passion. Interestingly the DNA Behavior Research program found that when comparing entrepreneurs who had built a $10 million turnover business as against a $1 million turnover business, that all the key DNA factors do not measure differences in an overall sense, but they do measure stronger. Do you see yourself as an entrepreneur? Are you heading up a business you founded? Have you taken over a family business? Whatever the situation that brought you to this season of life, if you don’t know your entrepreneurial traits and understand how to manage them, and perhaps more importantly, how to fill the gaps in your talent, you may be heading for the failure statistic graveyard. So what exactly is Behavior Bias? And can it be avoided? Yes, Behavioral Bias can be mitigated, it’s just a matter of developing Financial EQ through behavioral awareness. Why do some Advisors repeatedly lose wealth and others accumulate it? Why, after developing investment goals, do some advisors then revert to knee-jerk reactions that may hurt returns? Is there more to advisors than just analyzing numbers and making decisions to buy and sell various assets and securities? How aware of their own behavioral biases are advisors? How aware are you, as an investor, of yours? 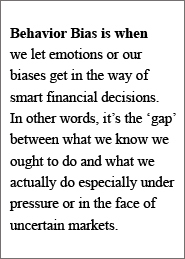 Behavior Bias is when we let emotions or our biases get in the way of smart financial decisions. In other words, it’s the gap between what we know we ought to do and what we actually do especially under pressure or in the face of uncertain markets. For advisors to be successful, they need to be able to manage their “emotional reflex system” when volatile events happen. They can’t control the markets, but they can manage their reaction to them. And the same goes for how they engage you, their client. 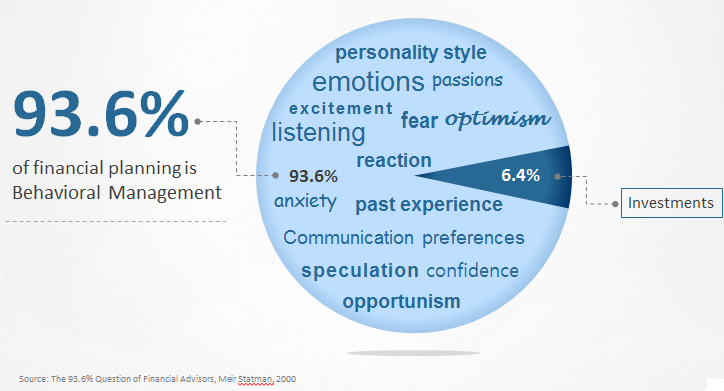 Also, behavioral bias doesn’t apply only to advisors. As an investor, you’re equally likely to be caught unaware. Your thinking and actions are influenced by the same set of factors and biases that affect advisors in their financial decision-making process. Qualities such as investing time into building relationships to build trust will help keep advisors from making personal investment mistakes. However, using a highly validated discovery process with your advisor will reveal decision-making behavior, immediately. Further, it helps uncover your own goals and priorities. 1. Acknowledge behavioral biases are inherent to everyone. - identify emotional triggers, the inherent go to’ decision-making process, under pressure. 2. Never assume’ that you are not biased. - as an investor, (driven by reputation, compensation, building a business, or managing expectations) you will make different decisions under pressure than when in a learned, calm, logical train of thought. 3. Keep your goals and financial capacity in focus-the big picture. - this path to success will keep knee-jerk reactions from disrupting progress. 4. Everyone has an inherent hard-wired behavioral style, which is the core of who they are, and emotional reactions can be predicted, with the right tools. 5. Communication is the key. - you must understand how to uncover a someone’s unique communication and learning style. - Matching styles will close gaps in communicating. Behavioral psychologists have long understood that people are not entirely rational. We’re influenced by a range of factors, from emotion to inherent behavioral biases, which make a less rational choice seem more appealing. If investors are to understand the behavior gap that will exist both for them and their advisors they need to learn about behavioral biases and other irrational behavior. Gaining this insight will deliver more effective and informed decision-making, which will stand up under market pressure. Times continue to change for financial advisors. Investor fears, lack of confidence and market uncertainty are provoking clients to demand better, more personalized advice from their advisors. Financial advisors who have moved to a behaviorally driven goals-based planning process will be the winners. Since the global financial crisis and recession, clients are driving the industry. 1. Unique; each has different wants and needs. 2. Each having cognitive biases, emotions, fears, anxieties, greed and excitement. 3. Thinks they are better informed in taking control of their finances. And advisors are struggling to navigate client’s emotions, inconsistent thoughts, and biases while maintaining control of the advisory process. 1. Trying to understand client’s behavior and emotional decision making. 2. Engaging to uncover and understand a client’s life goals. 3. Applying an understanding of client behavior to their investment style. So how can firms develop a scalable framework and service model for financial advisors to address the unique wants and needs of individual investors? Goals based Planning, based on the following 5 step process. b. Identify, for the advisor, the client’s likelihood of achieving the goals and then enable measurable steps to be added. c. Goals set relative to feasibility and other life and family priorities. 4. To add further value to the advisory process, Financial advisors should also complete the behavioral process. a. The advisors own naturally ingrained biases will be revealed and can be managed. b. Produce long-term relationships with clients when matching character traits and communication styles. c. Advice given based on life plans and dreams, rather than by pure performance of investments. 5. Deliver a greater level of communication and a deeper trust will be built. a. Meetings are more effective with the focus on achieving goals as a way to increasing wealth and achieving quality of life. b. Turbulent markets are easily navigated with awareness of how the client will respond and then, how to communicate accordingly. c. Linking financial personality with communication style will deliver a significant step forward in the way of financial planning. 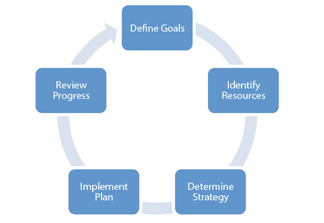 Developing goal-based plans is not a new concept. However, linking it with the key foundational process of uncovering inherent behaviors is. The two approaches together will deliver not only a more effective outcome for the client but will be an industry differentiator for the advisor.